Do you have a layover or only one day to spend in Frankfurt? If you have 24 hours in Frankfurt or less, I have put together the perfect itinerary to make the most of your short visit. There are enough things to see and do for a long day in Frankfurt, so feel free to skip a few things if you enjoy exploring at a more relaxed pace. Short on time and would prefer a tour? Chances are that you have flown though Frankfurt Airport in route to other European destinations. Even if you don’t have plans to spend the night, the airport is conveniently located close to the city, so it is easy to see Frankfurt during a layover. It is only 10-15 minutes by train from the airport to the city center. Frankfurt has no shortage of places to stay. I like having my own kitchen when I travel so I prefer to stay at luxury self serviced apartments like Capri by Fraser Frankfurt. In addition to having a kitchenette, other amenities include free wi-fi and a 24 hour business centre. Altstadt (old town) located on the northern Main river bank is a must on any Frankfurt itinerary. 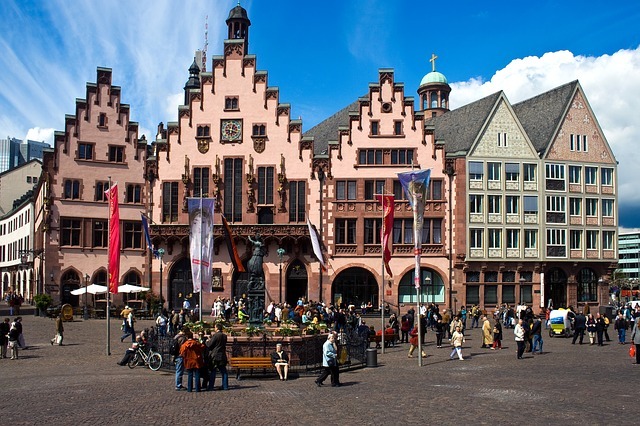 Many of Frankfurt’s must see sights are located in Altstadt, including the Römerberg plaza and Römer city hall. The Römerberg is the central square of the Altstadt. 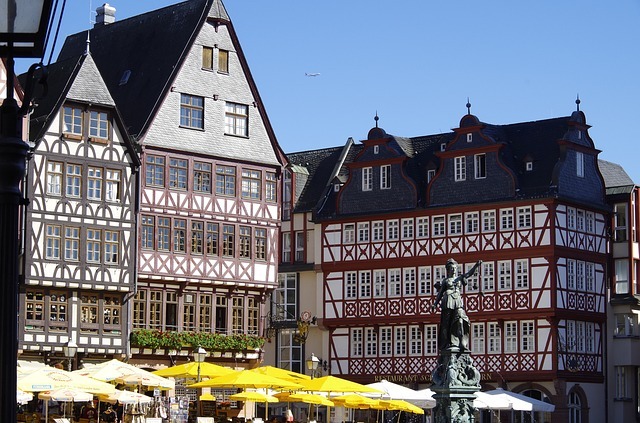 This cobbled plaza is lined with original and reconstructed half-timber medieval buildings and is one of the most picturesque parts of Frankfurt. In December, this is where you will find the Frankfurt Christmas Market, which is one of the oldest and largest Christmas markets in Germany. Make sure to check out Römer (Frankfurt’s city hall) and the Alte Nikolaikirche (St Nicholas’ Church). Eiserner Steg is a pedestrial only iron bridge connecting Altstadt with Sachsenhausen across the Main River and one of the most famous bridges in the city. Crossing the bridge is a pleasant walk and gives you great views of the city and the river. Visitors can take a cruise on the Main River. 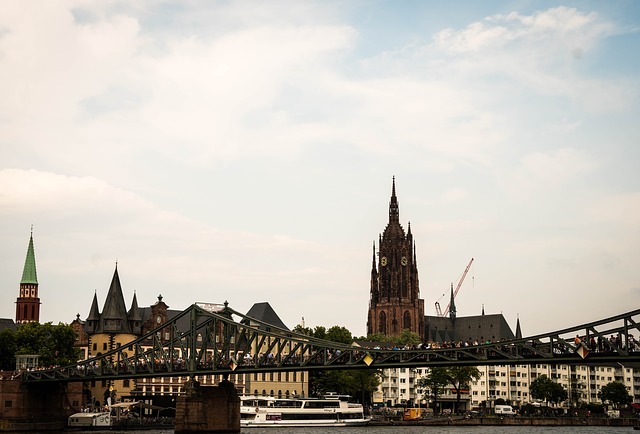 The cruises last about an hour are a great way to see more of Frankfurt in a short time. The Dom is a beautiful Roman Catholic Gothic church located in the centre of Frankfurt. You can pay a small fee to climb the narrow steps to the top of the cathedral tower where you can enjoy impressive city views. Kleinmarkthalle is a large indoor market hall open daily except on Sundays and a foodie paradise. There are about market stalls that sell fresh food, produce and flowers. This is a great place to try regional local specialties and German food as well as international food. Make sure to try the Green sauce (made of seven different kinds of herbs and served with with hard-boiled eggs and boiled potatoes) and local sausage, Fleischwurst (served with a crusty bread roll, mustard and a giant pickle). The Zeil is a popular shopping promenade in Frankfurt with countless stores. Make sure to check out the the MyZeil shopping mall which has 8 floors and an interesting curved glass façade. The Main Tower (named after the Main river) is the 4th tallest building in Frankfurt as well as Germany but is the only skyscraper in Frankfurt with a public viewing observatory. The observation deck has amazing views of the city and the river and is a popular attractions for visitors. Sunset is one of the best times to visit but it does get crowded at that time especially in the summer. On summer weekends the observation deck stays open to visitors until 11pm so this is a great place for a romantic evening. Opening hours vary by day and season and the observation deck closes if there is bad weather or strong winds, so make sure to check the website to make sure it is open. Tickets can be purchased online if you prefer to save time and skip the long lines. Holders of the Frankfurt Card can save 20% off the regular ticket price. There is also a restaurant & lounge on the 53rd floor where you can enjoy great views while eating lunch or dinner. There are a few different tours you can join to make the most of your limited time in Frankfurt. This hop-on hop-off city tour stops at some of the attractions listed above as well as other major Frankfurt attractions. 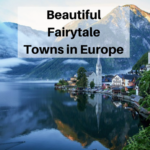 While there are enough things do see and do in Frankfurt to fill up your day, if you prefer to get out of Frankfurt for part of the day, there are half day tours from Frankfurt to the underrated city of Heidelberg. Heidelberg is a beautiful city famous for its prestigious university and the Heidelberg Castle. 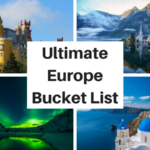 These are my top choices for the top things to do in Frankfurt if you only have one day. 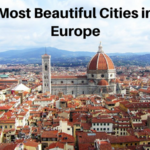 Have you visited Frankfurt? If so what would you recommend first time visitors see and do if they only have a day?